Give joy. The right gift for every occasion! Giveering away gift cards is always a good idea. Joy & well-being for the whole family. Over 1000 health products. Giveering away gift cards is always a good idea! Whether you want to do something good for your loved one or just need a great gift in the short term, the VITERNA gift voucher always goes down well. What is more valuable and important than the health of your family and friends? 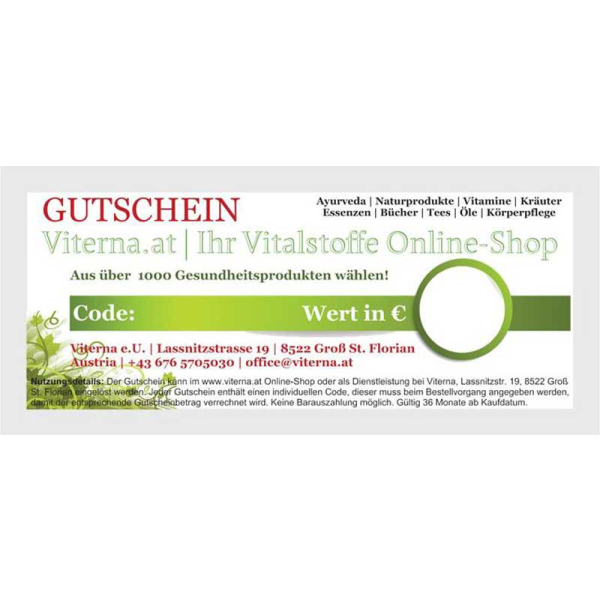 You can redeem this voucher in the Viterna.at vital substances online shop, with a telephone order or at an consulting service on site at Viterna.at, Lassnitzstrasse 19, 8522 Groß St. Florian, Austria. Get some of our more than 1000 health products from over 20 brands and enjoy them with friends or alone. Give away what really great present - with a gift voucher, you give away pure joy, because the recipient can choose for the value his heart desires. For example, you can redeem the value with a single purchase with the indication of the individual code on the voucher. Choose Gift Cards with value 10 Euro, 20 Euro, 30 Euro, 40 Euro, 50 Euro, 70 Euro, 100 Euro, 150 Euro und 250 with individual code for purchasing products in the VITERNA.at online shop or on-site. The voucher will be sent to you in an empty white envelope! 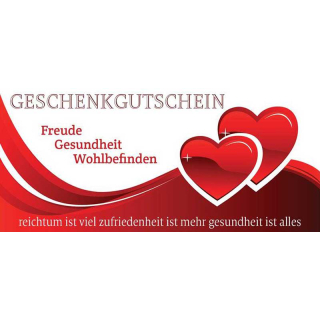 The voucher is only available in German language! The indivual code and value is noted on the gift card. This code can be entered in the online-shop in the shopping cart under "Voucher code" / "Apply coupon" / "Reedem voucher". The amount redeemed will be shown separately in the order overview. The amount can only be redeemed once. If you redeem only a part of the total voucher value in the shop, then it will take some time for a new order, for security reasons. The voucher can be redeemed in the online shop or as a service at Viterna. Each voucher contains an individual code. No cash payout possible. Valid 36 months from the date of purchase.